It seems October is shaping up to be the month for celebrity weddings. 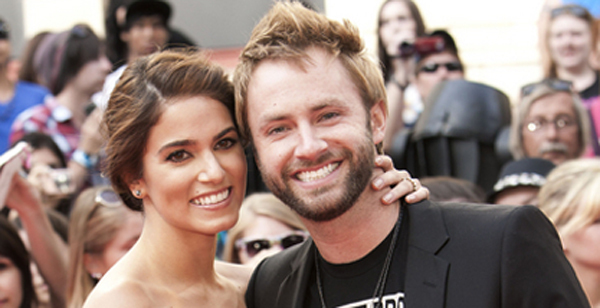 Twilight Saga star Nikki Reed and fiance American Idol alumni Paul McDonald tied the knot in an intimate ceremony in Malibu, California on Sunday. In front of 100 of the couples closest family and friends, the pair took the plunge at a private ranch. Nikki’s maid of honor was Spy Kids star Alexa Vega. Nikki and Paul were dating only seven weeks when rumors started flying that the pair were engaged. When asked about the diamond engagement ring she was spotted wearing at this past summer’s MTV Movie Awards, Nikki said “I love him and I don’t care,” obviously referring to the fact that they’d gotten engaged so quickly. While further details of the private ceremony haven’t yet been released, you can see Nikki Reed reprise her role as Rosalie Hale in the fourth installment of the Twilight Saga. She’ll star alongside Robert Pattinson (last years June Mougar of the Month), Kristen Stewart, Taylor Lautner and Jackson Rathbone in The Twilight Saga: Breaking Dawn Part One which will premiere in theaters November 18, 2011. So what do you think of the two tying the knot, Celebstalkers? Leave your comment and become immortalized forever! Kellie Pickler and her fiance, songwriter Kyle Jacobs, were married on New Years Day in an intimate ceremony held on a private island in the Caribbean. People magazine confirms that the couple was engaged back in June. 24 year old Kellie, who found her stardom through American Idol and is now one of country music’s most popular female artists and her new husband, Kyle Jacobs, has written songs for country superstars such as Tim McGraw, Garth Brooks, Teri Clark, Trace Adkins, Vince Gill and of course, Kellie Pickler, just to name a few. Celebstalk wishes the newlyweds a long and happy marriage! Steven Tyler To Bring Some ‘Sweet Emotion’ To American Idol! It’s official! Mougalicious Steven Tyler, lead singer of the legendary band Aerosmith, will be joining the panel of American Idol judges for season 10! Multiple inside sources confirmed the news of the done deal to E! News and Access Hollywood, saying that the deal with Tyler had been completed. In case you’ve been living under a rock for over 30 years, Aerosmith has had such hits as “Dream on”, “Don’t Wanna Miss a Thing” and “Crazy”, to name just a very few. While there is reportedly one more spot open for the final judge, we aren’t sure who they’ll pick. Although it is still rumored that Jennifer Lopez is still a top pick from FOX, new rumors circulating that the diva’s demands were too high. The studio is said to be speaking with several “big celeb names”, so who knows who they’ll pick…maybe Foxtrot Charlie or Echo Bravo should audition?? So what do you think Celebstalkers? Do you think Tyler will make a great addition to the panel? Or do you think they should go another way? 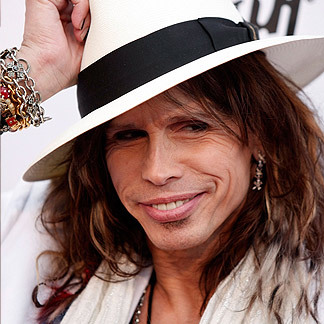 One thing you can be sure of with Steven Tyler is that you won’t be getting the “same old song and dance”!